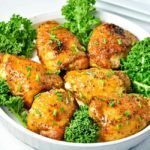 This Paleo Honey Mustard Chicken with Turmeric dish makes crispy chicken with a creamy, spicy honey-mustard sauce. It’s baked to perfection in the oven. 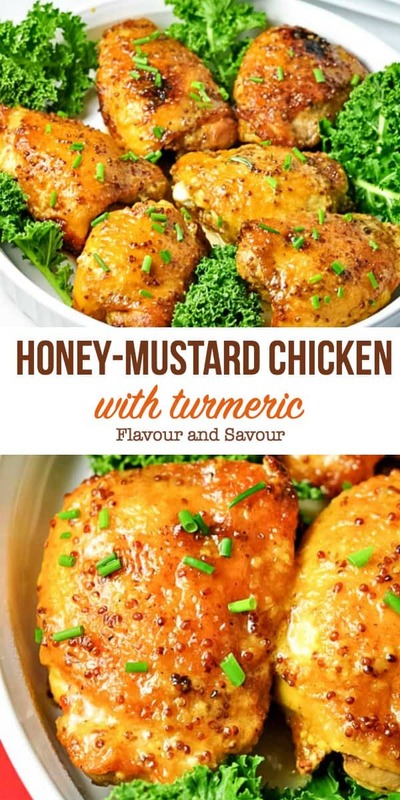 Crispy on the outside, tender and juicy inside, this Honey Mustard Chicken with Turmeric is blanketed with a creamy-dreamy, sweet ‘n spicy honey-mustard sauce. I swear I could eat this every day. 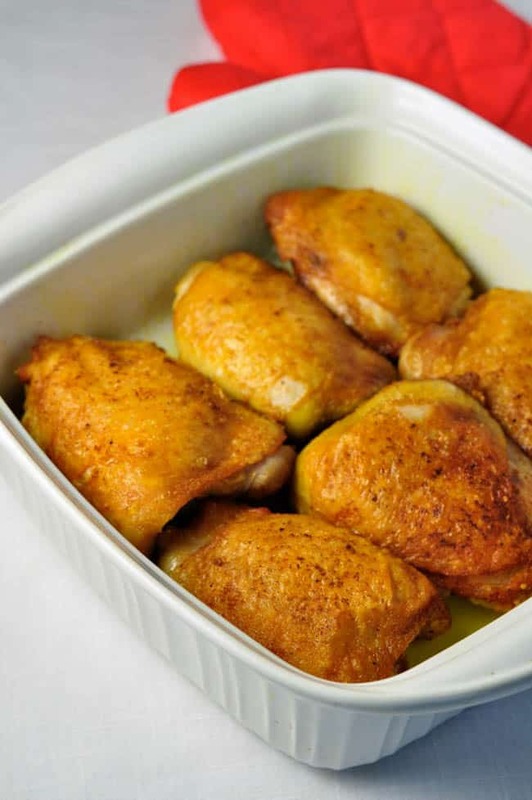 (Well, maybe every other day, so I could have my Easy Baked Lemon Chicken on alternate days). This recipe has the added benefit of turmeric. 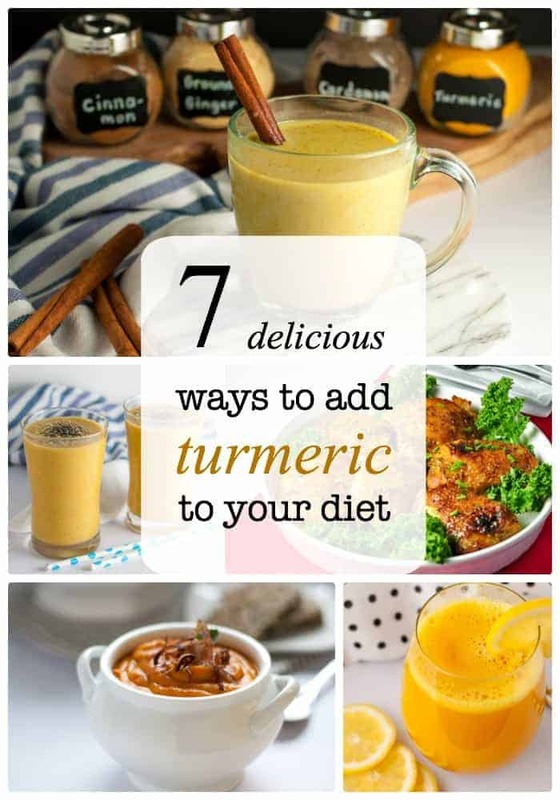 Besides adding flavour and colour to the chicken, turmeric has other anti-inflammatory properties that may help in preventing disease, so I’m often looking for ways to include more of it in my diet. I used to shun any chicken that wasn’t a boneless, skinless breast, convinced that the higher fat content would put me into cardiac arrest. I’ve since learned that the difference in fat content is negligible, however. 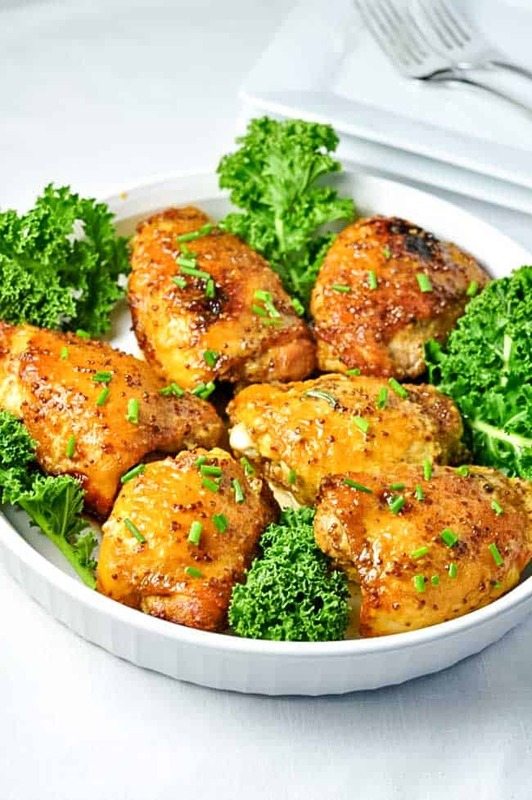 Thighs have so much more flavour and if you keep the skin on during cooking, the meat remains tender and juicy. Remember, you don’t have to eat the skin! Searing chicken parts has sometimes been an exercise in frustration for me, as that precious skin that I want to keep to protect the meat can get stuck to the bottom of the skillet. I read all about the chemistry behind chicken sticking to the pan, but if you’d like to avoid reading all that technical explanation, just follow these instructions. Heat the skillet first. Empty. Watch it carefully. Don’t go walking away to put on a load of laundry. Now add the oil. Use your choice of oil, but choose one with a high heat tolerance. The oil will heat up very quickly. You’ll know it is ready when you see ripples. Next, carefully add the chicken, give the skillet a little shake and then leave it alone for a few minutes. Don’t go moving it around the pan or it will stick. Once it is seared, it will release on its own. Shake the pan a little and it will slide easily if you give it a little nudge. Then you’ll be able to pick it up with tongs and flip it over to sear the other side. You may find conflicting advice on using a cold pan/cold oil or a hot pan/cold oil, but this method is the one that works well for me. to check the internal temperature. 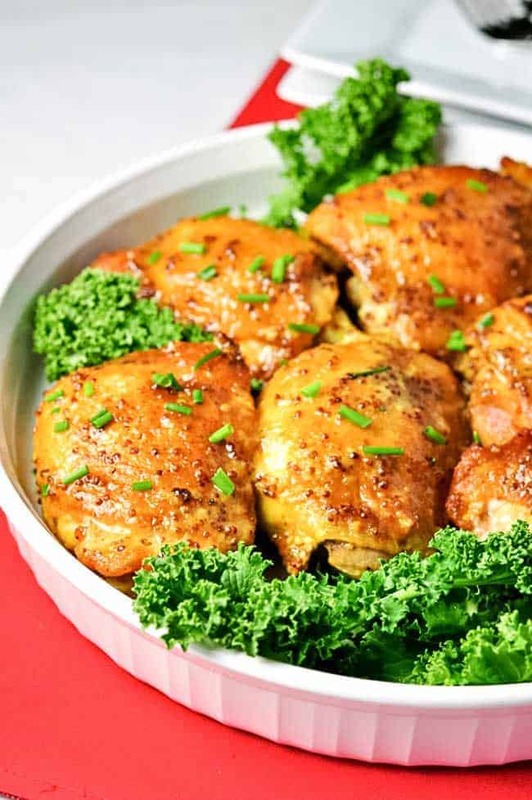 Cook thighs to 175°F., a little higher than is recommended for other chicken parts. Transfer to a serving dish, garnish with some fresh herbs and serve. If you make this recipe, let me know how you liked it in the comments section below, or tag me @flavourandsavour on Instagram. I love seeing what you make! 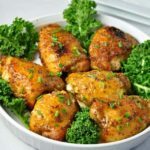 This Honey Mustard Chicken with Turmeric dish makes crispy chicken with a creamy, spicy honey-mustard sauce. It's baked to perfection in the oven. 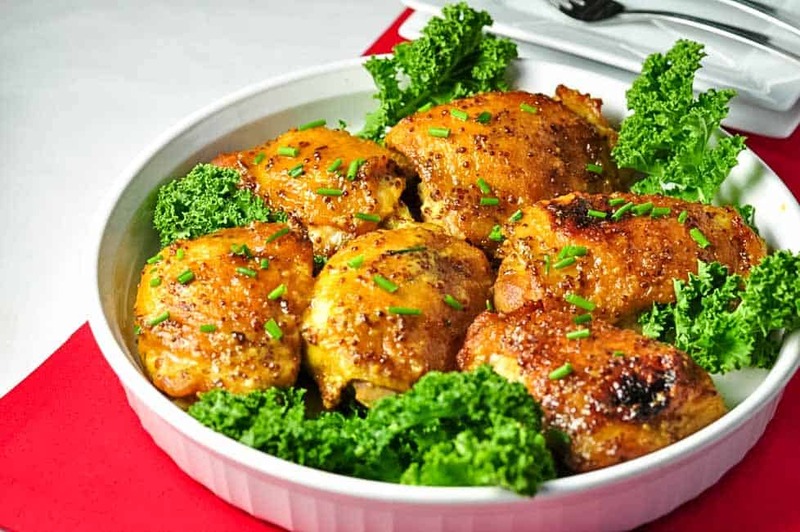 Combine the rub ingredients and work well into the chicken thighs, covering all surfaces. Whisk together the honey-mustard sauce ingredients and set aside. Heat large heavy-bottomed oven-proof skillet on stove. When heated, add oil to cover the surface. Sear chicken on both sides till golden brown and crispy. Drain excess oil, then pour honey-mustard sauce over all. Place skillet in oven and bake for 30 minutes or until meat thermometer indicates an internal temperature of 175F. Serve. Turmeric will stain. Protect your clothing and avoid using plastic utensils. I find that if you do get it on plastic or on your countertops, rub it with a little oil first, then use your usual cleaning method to remove it. 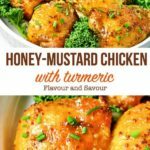 I make a honey-mustard chicken dish that has rosemary in it, but turmeric? I never would have thought to use it, but it sounds divine! I will be trying this out soon! Mmmm . . . I love rosemary! Great idea, Amy-Lyn. Hope you like this one with turmeric. It adds a kick of flavour and an appetizing colour too. Thanks for commenting! This was my first time making it so I used all the ingredients the recipe called for except I swapped the sugar for brown sugar. I put all the ingredients except the chicken into the saucepan and bought it to a boil and simmered it for about 10 mins. While i simmered the sauce, I browned the chicken in a frying pan. I then tossed the half cook chicken into the sauce and boiled away the remaining liquid until it made a rather thick glaze (about 30 mins). It was a delicious tender chicken. Thank you so much for introducing me to this recipe! Thanks for sharing your method with the rest of us! I’m glad it turned out, and I appreciate your comment. Made this last night and it turned out perfectly. So good! I’m glad you liked it. I make this recipe a lot. It’s one of our favourites. Thanks for commenting and giving it 5 stars! We made this last night but used thighs and legs. You can really do all parts of bird but cooking evening might be more difficult. Excellent flavor and we wish more sauce was available. One area we need to work on is the chicken browning since it caused lots of oil spattering. Either move outside to a twok or grill. I have made this several times and enjoyed it. The only difference is that we cook boneless/skinless chicken thighs in a sous vide with the dry ingredients, then finish them in a skillet. We use the sauce on top after it is done browning in the skillet. A bit different but still a great recipe! Your alternative sounds delicious! Thanks so much for sharing with the rest of us! I’m so glad you liked it, Tabby! It’s a favourite in our home, too. Thanks for letting me know.